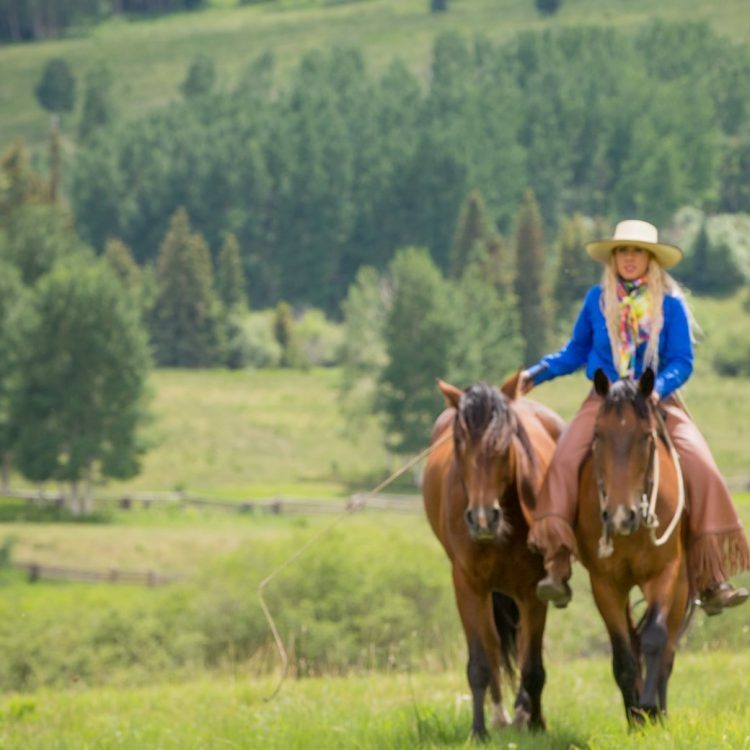 Answers to frequently asked questions on a wide variety of topics including; horse training, coaching, sponsorships, care, general tack, and shop. Can you train my horse? Although I would LOVE to help EVERY horse, I am only one person and limited in time, money, and resources to be able to do so. If you need help with your horse, I recommend first reaching out to a local Mustang T.I.P. trainer through the Mustang Heritage Foundation. Although I do not personally endorse any other trainer’s program at this time, T.I.P. trainers are experienced in handling wild horses and can be a good resource for gentling horses or working through difficult training issues. It is also an option to attempt rehabilitation on your own or seek out a local trainer who is willing to learn my program through my online resources. If you would like access to expert videos and advice, I recommend joining The Mustang Maddy Academy. There are several types of learning opportunities inside the academy: Membership, Courses, and Case Studies. My horse is doing XYZ, what would you do? If you have a training question, the best way to learn my approach is by joining The Mustang Maddy Academy. There are several types of learning opportunities inside the academy: Membership, Courses, and Case Studies. Our member area currently has around 150 raw, unedited training videos in a well-organized library along with updated content monthly! Inside the membership, you will also have access to a summary of what my 5 Golden Rules are and how to apply them to your training. One of the best parts of being a member is you will also be connected to my private Facebook group where I host monthly, live Q&A sessions with members! This is a great opportunity for you to ask me your specific training questions. Membership enrollment is $24.99/month. Online courses offer in-depth training on specific subjects. Currently only a single course is offered, however, in the future, there will be several more to choose from. The 5 Golden Rules of Horse-Human Connection is currently available. It includes 10 modules that are complete with readings, videos, activities, journal entries, and quizzes to apply the information learned. Think of the 5 Golden Rules in terms of cooking; If you wanted to become a master chef, would you spend your time learning the technique behind building a recipe or memorizing the recipes themselves? Of course, you’d want to learn the technique behind building the recipe in order to create your own! Not only does this allow for your creativity to shine through, but you also shave off huge amounts of time others lose by memorizing countless recipes. It’s the same with our horses. The 5 Golden Rules are the guiding principles behind every training exercise, problem-solving approach, or building of a behavior. Learn these 5 principles and you will bypass the trap of having to memorize thousands of scenarios, not to mention understand the “why” behind everything you do with horses. The 5 Golden Rules course is $397 or $60/month. Academy Members receive 10% off of this course. This is a detailed course which details the science behind my rules of horsemanship. Included in a course is a great deal of text, supporting videos, summaries, and quizzes. Finally, I offer case studies of various mustangs I am training from the wild or rehabilitating. 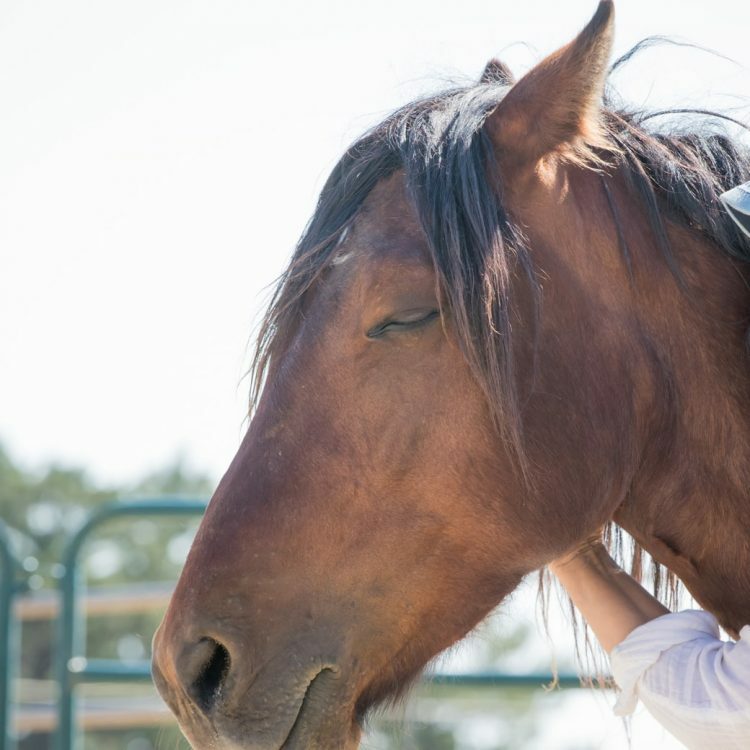 Case studies follow the progress of a single mustang in real time and include over 30 hours of raw video footage as the horse progresses in training, oftentimes overcoming serious and dangerous issues that have made them previously unadoptable. Case studies range in price according to the length of the video series. Liberty is not a discipline like Western or English; rather, it is a way of communicating with horses on such a refined level that a physical connection is not necessary. Therefore, you will often see me working with horses without any halters, lead ropes, or bridles. When horses are in this state, they are working with a human by their own free will, “at liberty;”. There is nothing keeping the horses from leaving the situation, but they are choosing to work and respond to my cues. I still teach the horses to respond to physical pressure (like halters and bridles) in order for them to be able to successfully navigate the world we are asking them to live in. My goal is always to be able to develop a relationship that goes beyond the ropes. Working with horses at liberty is incredibly rewarding. I first began exploring liberty because I wanted my horses to be with me as much as she wanted to be with them! But it also has implications for performance and safety because it builds clearer communication between my horses and I. When using this process, I become more aware of what motivates my horses and zebras. 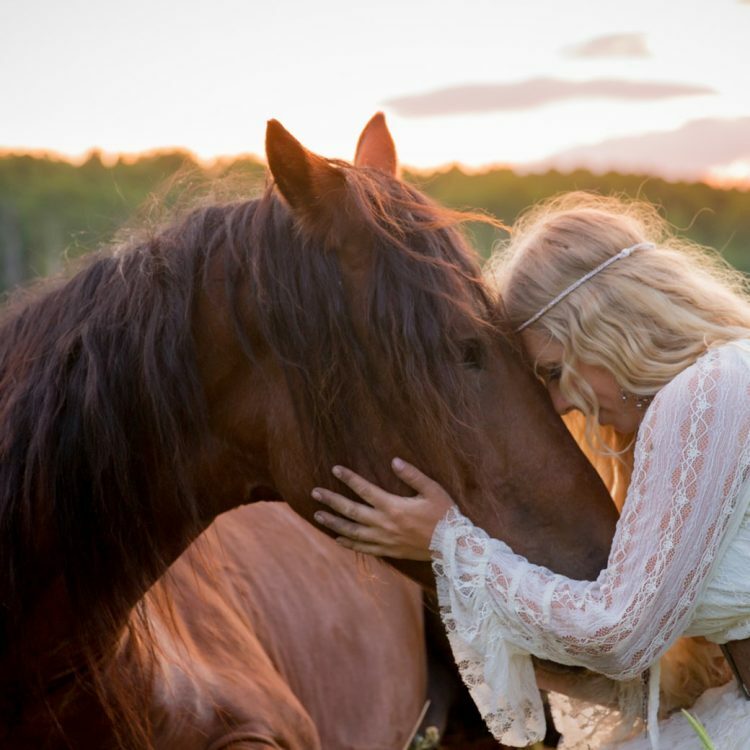 Therefore, building a relationship at liberty with your horse can help build other areas of your relationship as well. It can allow you to be safer on the trails, score higher on a dressage test, run a faster barrel pattern, or anything else you dream of! Do you do 1:1 coaching? I am not currently doing 1:1 coaching, but please watch the event calendar for a retreat, immersion program, or meet the mustangs event near you! What do you feed your horses? I prefer to feed my horses a natural diet whenever possible, My feed of choice is Crypto Aero Wholefood Horse Feed. Crypto Aero is a feed with no GMOs, chemicals, corn, soy, wheat, or molasses. It consists of a mix of oats, timothy hay pellets, alfalfa hay pellets, sunflower seeds, green peas, yellow peas, rice bran oil, ground flax, rose hips, green cabbage, papaya, algae (spirulina), organic yeast, anise, and fenugreek. Crypto Aero’s quality ingredients allow for a reduced grain load; My horses typically get 2 lbs of Crypto Aero daily. Through Chewy.com you can order Crypto Aero and have it delivered right to your door. I also feed Chaffhaye, non-GMO bagged alfalfa which is rich in yeast and enzymes like natural growing pasture would be. It is also low in sugars and starches. Do you believe in alternative medicine for horses? Yes, I’m a big fan of using alternative medicine for horses (and myself!) whenever possible. How often do you get your horse's teeth floated? How often I get my horses’ teeth floated depends on the horse and his mouth as well as what his job is. However, it usually ends up being every 6-12 months. I recommend consulting your veterinarian and/or a reputable equine dentist to create a plan that’s best for your horse. Do your horses have shoes? No, my horses do not have shoes; mustangs, in particular, are known for their strong, healthy feet! I am an advocate of keeping horses barefoot unless shoes seem to be absolutely necessary for that individual given his use or unique health needs. To learn more please read The Benefits of Going Barefoot. What kind of bridle and bit do you use? What kind of bridle I use depends on the horse and his level of training. I prefer to start horses in a halter or loping hackamore. I then advance them depending on their career path. If they will be ridden with a high level of refinement, I will introduce them to a bit. I prefer to do so with a soft rubber bit; good ones are hard to come by. I prefer the Herm Sprenger Duo D-Ring Bit. From there I may advance the horse to different bits depending again on his career path; however this bridle set up would be sufficient for the majority of hobbyists who take the time to develop softness and refine their communication with their horse. What kind of saddle pad do you use? I use a CSI saddle pad. Every feature of the CSI Saddle Pad system is designed with my horse’s comfort and performance in mind. The system works with all types of saddles including traditional, flex panel and treeless saddles. At the heart of the CSI system is the revolutionary CSI Flex-Plate. First and foremost, this in-pad plate increases the contact area of the bars. This spreads the pressure of the saddle and the rider’s weight out over a larger surface area which in turn reduces or eliminates pinch and pressure points. To find a CSI saddle pad, visit www.csisaddlepads.com. What kind of reins do you use? Why do you use a neck rope? I use a neck rope to teach refined communication with the head to prepare for bridleless riding. The neck rope is made from horse hair and ranges from 3-5 ft. in diameter. To purchase a hand-made neck rope, visit our online shop. 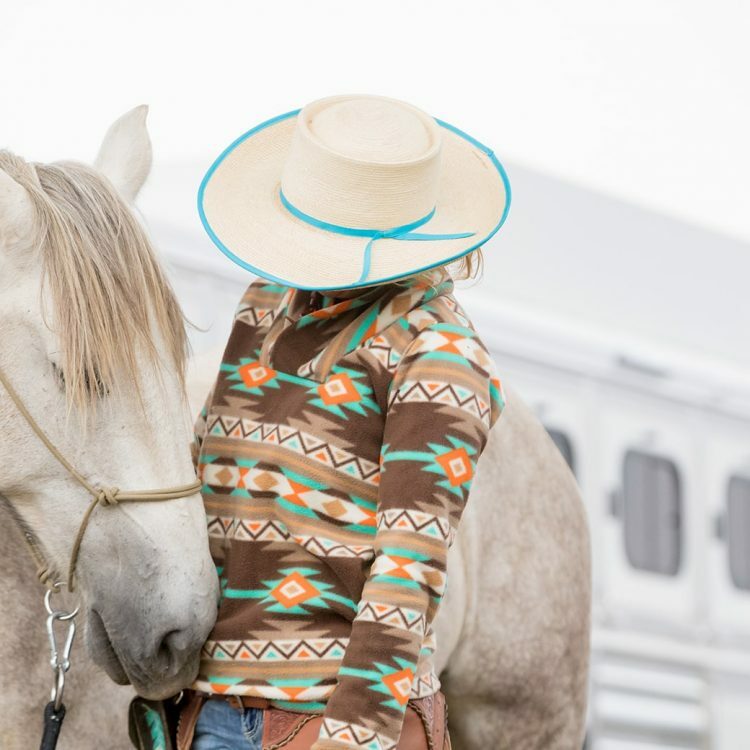 Do you always put boots on your horses when you work with them? I almost always use boots when I’m riding or working on the ground to help support the cannon bone, tendons, soft tissue, and to absorb energy from hoof impact. Boots also help if you are working on maneuvers and lateral work in case the horses legs come into contact with one another. What kind of whip do I need? I have teamed up with Fleck, who has been producing riding crops and whips for 140 years, to bring you the highest in quality when it comes to essential tools as a part of Maddy’s training program! Each whip has a unique, lightweight and easy to hold FLECK-grip. They are made of flexible fiberglass, offering a unique stiffness that Maddy loves. Additionally, the woven nylon cover allows for longer lasting durability that will serve you for longterm use. Dressage whip: Used for short-distance training online to set clear boundaries and gain precise communication both on the ground and under saddle with the horse’s shoulders, ribcage, and hindquarters. The dressage whip is also an essential tool in Mustang Maddy’s colt starting program to translate cues learned on the ground to ridden work. Carriage whip: Used for medium-distance training such as circles, which require communication with different body parts in motion and at a greater distance. Also used for driving and direction in liberty training. This whip is also Maddy’s choice when working with multiple horses at liberty from a ridden horse. Lunge whip: Used for greater-distance training such as liberty on the ground as well as creating impulsion and direction for young horses who need more “room” as they are developing their balance. To purchase any of the whips that I use, visit our online shop. What kind of hackamore do you use? My hackamore is a handmade vaquero, buckaroo style bosal. You should be able to do a simple internet search to find a quality handmade hackamore that meets your needs. My boots are made by Twisted X. You can find out more about Twisted X boots and shoes by visiting twistedx.com. What brand of hat do you wear? Why do you use spurs? If you have ever looked closely at a video where Maddy is riding, you’ll notice Maddy almost never needs to cue with her spurs, as proper, ethical use (and release!!) of pressure during training and riding means she can cue with just a “whisper” (no pressure at all or the lightest touch) and her horses respond. But in the event that something comes up where a greater, more accurate amount of pressure is required (ex here: if the cattle had spooked and began stampeding), the hardly used spurs are still available if needed. When she does use them, she does so in a way that is predictable and painless. Watch for the future video where Maddy talks about all of this more in-depth! What kind of saddle do you use? What kind of saddle I use depends on the discipline I’m riding! The one you see in a lot of my photos and videos is a handmade wade ranch saddle. Will you come and do a clinic in my town? My schedule fills up quickly. If you have interest in hiring me for a clinic or event in your town, please utilize the contact form and select “Hire Maddy” under the “What can we help with?” section of the form. I look forward to seeing you at my next event. How do I request an interview for an article/blog? Thank you so much for your interest in sharing my story! The best way to get started is to take a look review Meet Maddy which includes my bio, links to previous interviews and articles, and special cover/television appearances. If you wish to set up a personal interview with me, please send requests to info@mustangmaddy.com. Thank you for your interest in being a Sponsor or Ambassador, I would love to hear from you! To submit your request, please utilize the contact form and select “Sponsorship or Ambassador” under the “What can we help with?” section of the form and I will get back to you as soon as I can. Where and when is your next event/appearance? Can I do an intership with you? My internship positions are currently full, but if you’d like to send your resume to info@mustangmaddy.com, we will keep it on file for future reference. Returns happen, and that’s ok! We want you to love your purchase and we will do everything we can to make sure you are satisfied. Before returning or exchanging anything, please glance over this information and email info@mustangmaddy.com with any questions. Returned items must be unused, unworn, unwashed and undamaged. Merchandise must be returned or exchanged within 30 days of original order date. Returns beyond this time will not be accepted. The cost of the return shipping fee will be deducted from your refund. You should expect to see your refund within four weeks of dropping your package off at the return shipper, although you will most likely see it much sooner. This time period takes into account the return shipping, our processing your return and your bank processing our refund request. Return shipping is free if the return is a result of our error (you received an incorrect or defective item). Once you place an order, you will receive a confirmation email. Once the item has been shipped you will receive a second email with a tracking number. Orders are processed for shipment twice a week, typically on Monday and Thursday. We understand there may be special circumstances where you need to have your order processed sooner. If you need assistance with your order, please email us at info@mustangmaddy.com. Shipping is calculated by USPS. Orders are shipped from zip code 50111.